Linguistic diversity has become a defining feature of Canadian classrooms today. Multilingual students, who speak different languages at home and at school, have become the norm rather than the exception, particularly in major urban centres. Take the Toronto District School Board and the Vancouver School Board: they both report over 120 languages spoken by their students and their families. It’s not uncommon for teachers today to have classes filled with students who speak many different languages at home. At a time when people are constantly on the go and technology makes it relatively easy to communicate around the globe 24/7, researchers have observed that children navigate their different language and literacy practices with natural ease; they have grown up in a world that depends on flexible language and literacy practices. Many teachers, however, don’t share students’ diverse linguistic backgrounds or experiences with growing up in a digitally mediated world. And teacher preparation programs often offer little required work with English learners and their families. Yet as classroom populations continue to diversify, the need to develop inclusive multilingual pedagogies also grows. Are there ways to bridge this divide? How can teachers draw on students’ diverse cultural assets and build on the linguistic expertise that students bring into today’s classrooms, rather than constraining it? Surely, all students should leave school with more expansive linguistic repertoires rather than losing their home languages in the process of acquiring the language of instruction. Further, how can teachers engage parents in their children’s language and literacy development if parents don’t speak the language of instruction? Teachers, naturally, don’t speak all of their students’ home languages! Dr. Jim Cummins has advocated that teachers engage multilingual students in the creation of what he calls “identity texts”: students are encouraged to use their home languages and cultural understanding alongside the language of instruction to produce multimodal texts for academic purposes that reflect students’ identities in positive ways. Over the past decade, researchers and teachers across the country have been putting this idea into practice through the creation of a range of dual-language books, documentaries, installation art exhibits and dramatic performances. Beyond the ESL classroom, identity text work can offer mainstream teachers a powerful strategy for building all students’ appreciation of linguistic diversity and for leveraging students’ and their families’ multilingual literacy expertise. Over the past seven years, I have collaborated with classroom teachers across English and French schools in Canada, France and the U.S. to explore the affordances, challenges and outcomes of engaging students collaboratively in multilingual project-based learning (MPBL). Most recently, I’ve partnered with elementary teachers in Toronto in English, French immersion and French language schools, as well as a private school, to design and implement MPBL across content areas such as social studies and science. 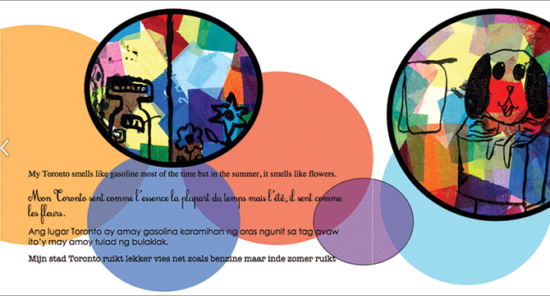 Over a two-year period, we worked with children in Grades 4-6 to produce collaborative multimodal and multilingual books using English, French and students’ home languages. Examples of students’ work can be seen on the project website: www.iamplurilingual.com. 1. Draw on the diverse languages of the school community, including but not limited to incorporating students’ home languages, local Indigenous languages, and the language(s) of instruction. Even if your student population does not include many speakers of other languages, teachers can always incorporate Canada’s official languages – English and French – local Indigenous languages and other languages represented across the wider community. Investigate language resources in your community so you can cultivate a rich language ecology in your classroom. 2. Invite parents, families and community members to contribute their language and cultural expertise to help students bridge diverse home, school and community language and literacy practices. Parents, grandparents and other family members may be hesitant to volunteer in a school where they don’t speak the language of the classroom. Invite them in to share their languages and experience as multilingual role models, not only for their children but also for the entire class. 3. Group students of different language backgrounds to work collaboratively on content-based projects, as a context for developing language and literacy skills along with content knowledge and understanding. While having students who speak different languages work together may seem counter-productive at first, keep in mind that the goal is not that they become fluent in all of the languages represented, but rather to develop a welcoming curiosity about languages and one another. 4. Build students’ metalinguistic awareness explicitly by actively comparing different languages and how language(s) function, and identifying patterns for cross-linguistic transfer. Draw students’ attention to how languages work and how they are related. Bridge from what students already know in their home and community languages to the language of instruction. 5. Publish collaborative multilingual projects for authentic audiences through an end-of-project celebration, and through the use of technology to reach broader audiences. Celebrate students as creative, multilingual producers rather than consumers. Plug into other schools, community groups and families to share the multilingual work that students generate to extend it beyond your classroom and to receive feedback and inspiration to keep on. Students’ reflections about themselves and their work speak to the importance of inviting students’ languages into the classroom. One student said about her group’s multilingual book, “No one knew I can speak Swahili before. It’s like now they know me for real.” Another student commented, “My work makes me feel original. I am the only person in the class who can read and write these three languages and that makes me special.” And yet another student remarked, “Before this project, I never liked reading and writing. Now I think I like it!” These powerful identity statements highlight how supporting students’ use of their home languages within the classroom increases their engagement; consequently, they produce high-quality work in which they take pride. Beyond the students’ positive responses, teachers consistently report that doing multilingual work with students shifts how they see culturally and linguistically diverse parents. When schools affirm students’ home languages and cultures, parents become language and literacy experts in the eyes of their children, and multilingual parents are empowered to actively participate in their child’s learning at school and at home. This parent’s reflection highlights that MPBL can forge mutually beneficial relationships among teachers, students and parents that multiply opportunities to affirm children’s identities as they integrate creatively their home and school language and literacy practices. Around the world where racial, linguistic, religious and political differences threaten to divide communities, the need to build bridges among teachers, students and families from diverse backgrounds is critical. Affirming and leveraging students’ cultural and linguistic assets helps move towards building more inclusive schools and gives students an opportunity to learn how to work together across their differences, within the microcosm of their classrooms. J. Cummins and M. Early, Identity Texts: The collaborative creation of power in multilingual schools (London: Trentham, 2001). This research was generously supported by a Joseph Armand-Bombardier Canada Graduate scholarship (2010-2013) from the Social Sciences & Humanities Research Council.